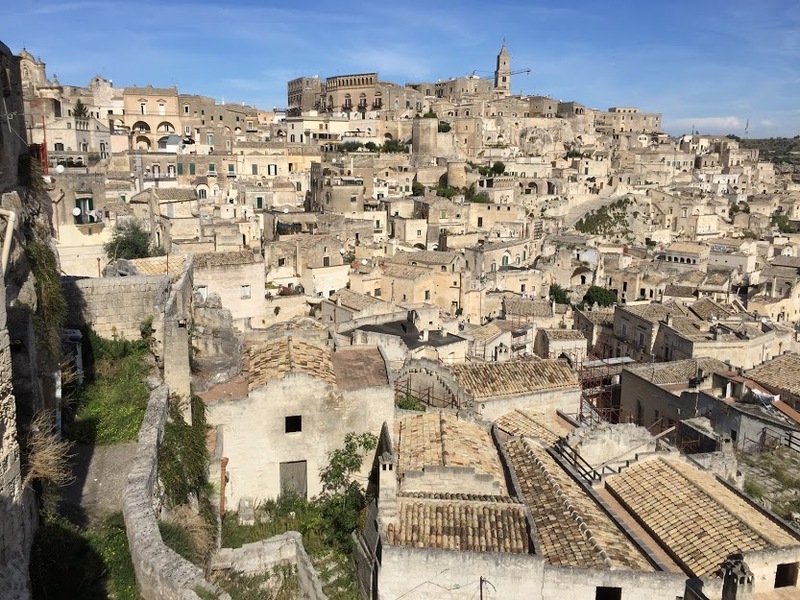 Last week I share 5 must see Italian towns that were not quite off the beaten path but were far enough down the bucket list to be less crowded. This week I’m share 5 more towns that are a bit more off the beaten path and will more than likely be even less crowded. These 5 must see Italian towns will surely be less crowded than any of the major cities that tourists flock to. 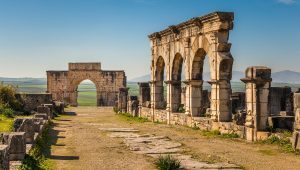 These 5 must see Italian towns may not be home to works by the Masters, boast huge cathedrals, or have major archaeological excavations, but each of them have a charm of their own. Many are home to some fine churches with beautiful works of art and some interesting ancient sites. And of course they all have charming piazzas and cobble stone alleys just waiting to be explored. Best of all you might be lucky enough to find that you have the place almost to yourself, at least you don’t have to worry about inattentive or rude tourists shoving you out of the way or photo bombing your pictures! 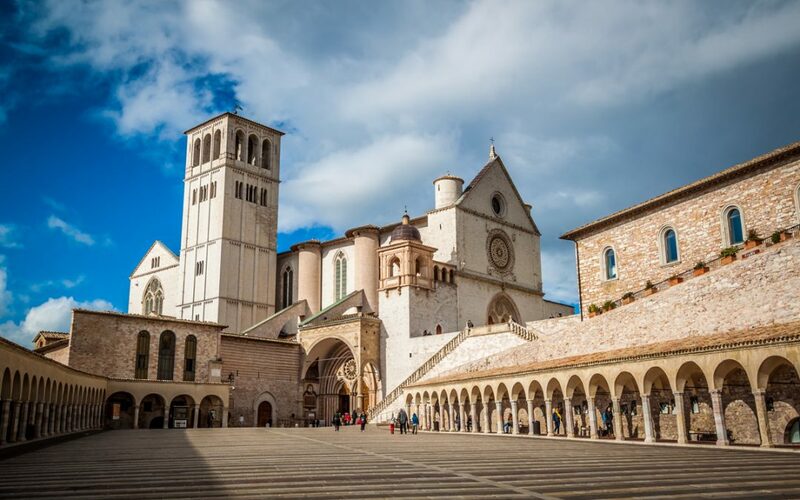 Assisi is a must see Italian town in the province of Perugia in Italy’s Umbria region. 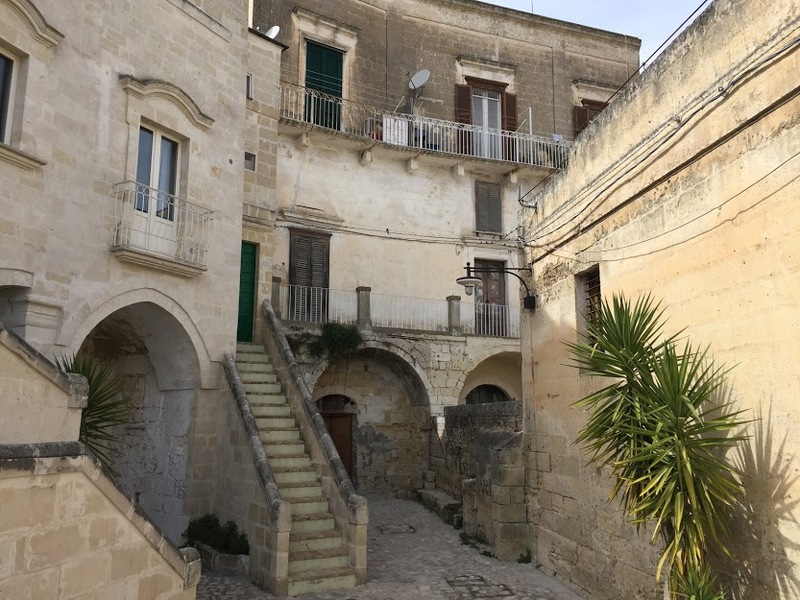 Though not quite off the beaten path, it is after all easily accessible by local trains and buses, it is a town rich in religious, historical, and archaeological sites. Assisi is most famous for being the birthplace of St. Francis of Assisi who was born in this town in 1182. He founded the Franciscans in 1209 which are a related group of mendicant religious orders with in the Catholic Church. 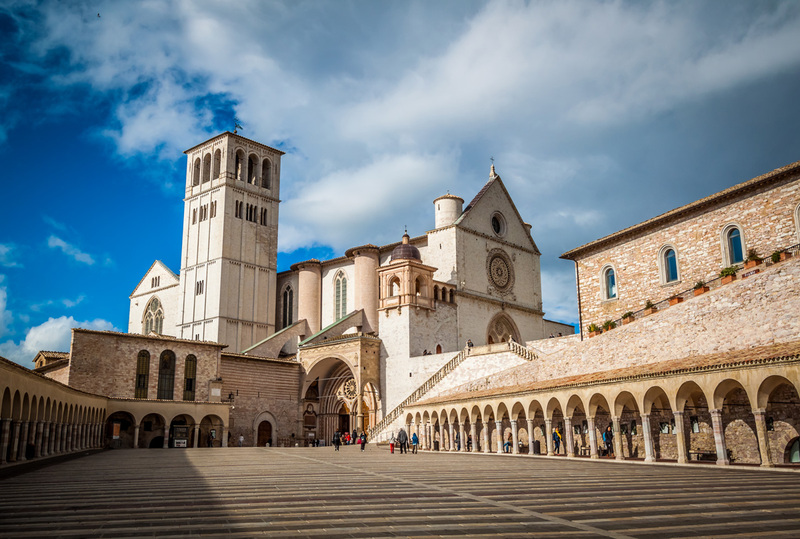 The Sister of St. Claire are part of this order as Francis and Claire were contemporaries in Assisi and both were dedicated to prayer and ministry of the poor, the sick, and animals. And yes, St. Francis of Assisi is the Patron Saint of Italy as well as the Patron Saint of Animals, Merchants (he was a fabric merchant before he founded his order), and Ecologists (because of his great love of nature). Today the Basilica of St Francis is a huge complex built to follow the slope of the mountain side. The lower basilica houses the tomb of St. Francis. Facing this basilica on the other side of the town is the Basilica of St. Claire and is where St. Claire is entombed beneath the main altar. Assisi is also home to the ruins of a first century Roman amphitheater. It has seen its share of war and blood shed throughout the ages having been sacked by the Ostogoths in the 4th. century, conquered by Fredrick I (Barbarossa) in the 12th. century, and sacked again by Napoleon. It also played a heroic role during WWII when the city gave asylum to persecuted refugees, mainly Jews whom the locals hid in convents dressed as nuns and friars. Many were provided with false documents. Assisi became one of the main centers for the Italian Resistance movement. Such generosity and heroism earned the city a gold medal for civilian honor. Assisi’s winding streets are filled with shops selling local crafts and religious artifacts. It is a popular pilgrimage destination and is filled with devout pilgrims on Sundays and the feast days of the Saints. So unless you are on a pilgrimage it’s probably not a great idea to visit town on those days. A weekday visit is much less crowded and you have the town almost to yourself! Getting to Assisi is fairly easy. You can get there by train, bus, or private car, and of course you can take a day tour from Rome or Florence. To get there by train take the train heading to Cortona, get off at Terontola and transfer to a local train to Assisi. Get off at the main station which is located in the valley and take a taxi or bus up to the town on the mountain. Of course you could also hike up and pass the areas on the mountains where St. Francis spent time in prayer and contemplation. Tarquinia is a must see Italian town located in the Northern Lazio region. Ancient Tarxuna, as Tarquinia was known is one of the 12 Etruscan cities. The Etruscans were Italy’s first known civilizations settling in what is now Tuscany, Umbria, and Lazio. Ancient Tarquinia was one of Eturuia’s most important cities and today is probably the best place to see Etruscan Tombs. The town and it’s ancient Necropolis is one of central Italy’s UNESCO World Heritage Sites. The town is also home to one of the best museums of Etruscan finds outside of Rome. There you’ll find these fabulous terracotta winged horses that date from the 4th. century BC. You’ll also see Etruscan sarcophagi and statues as well as clay vessels and intricate funerary gold jewelry. The archaeological museum is housed in the Palazzo Vitelleschi on Piazza Cavor the town’s medieval center. The town’s Cathedral boasts good frescoes dating back to 1508 and other interesting churches. But the town’s real attraction are the Etruscan tombs in the Necropolis. There are about 6000 tombs dug into the soft tufa dating back from the 6th. to 2nd. Centuries BC. The tombs are decorated with beautiful frescoes which still look vivid even today. The Necropolis is located just outside of the town wall. There is a free bus that run from town to all the sites including the tombs but it’s a nice walk through the town and up to the tombs. If you wish to visit both the tombs and the museum there’s a combination ticket which allows entrance to both. I would recommend having a look at the tombs first, there are about 15 or so open each day. Each tomb is from a different period allowing one to see the different styles thru the ages. The tombs are protected by these concrete “houses” and you’ll have to walk down some stairs to view the frescoes, definitely worth looking at several at least. After the Necropolis you can head back to town and make your way to the museum to see some of the artifacts found in the tombs. Then you can wander thru the medieval streets or have a snack at the piazza. One of my favorite treats is the ricotta pizza you can find at the local pizzaria! Getting to Tarquinia is very easy. From Rome take the train to Tarquinia, it’s about a 1 1/2 to 2 hour ride. From the station take the bus to the town center. If you’re on a cruise ship that’s docked in Civitavecchia you can take the Cortal (Blue bus) from Piazza Vittorio and get dropped off by the Tarquinia InfoPoint. The ride is about 25 minutes. Bracciano is a small town in the Lazio region. It is situated above the volcanic lake from whence it’s named. Lago di Bracciano is the 2nd. largest lake in the region and the 8th. largest in the country. One can canoe, swim, sail, and even dive in the lake specially during the hot summer months. The town above offers beautiful views of the lake below. But it’s real claim to fame is the very well preserved medieval castle called Castello Orsini-Odescalchi which dominates the hilltop town. This castle was also the venue for Tom Cruise’s wedding to Katie Holmes. You can take a tour of the castle, it’s huge and very cool! After you can wander the streets of the old town and stop at one of its fine restaurants for a meal. In the summer you can camp down by the lake and lounge on the beach or swim, sail, or canoe. There’s also a ferry that will connect Bracciano to the other 2 towns on the lake. The modern town of Ostia is basically a suburb of Rome. There’s not a whole lot to see and do in the actual town itself. The main attraction of this town is it’s vast archaeological site called Ostia Antica. Back in the day it was a very important city because it was Rome’s ancient seaport. The sea has long receded and it’s no longer a coastal city, but the Archaeological site is fairly well preserved and offers a glimpse at how it was when it was a bustling seaport with over 60,000 residents. To get to there make your way to the Ostiense Train station or the Piramide Metro (the lines are intertwined here). Walk over to the Lido line – it uses a metro ticket or pass – and hop on a train. Get off at the 7th. Stop – Ostia Antica. From the station walk over the bridge and follow the street to the park entrance. Buy your ticket at the kiosk before the gate. 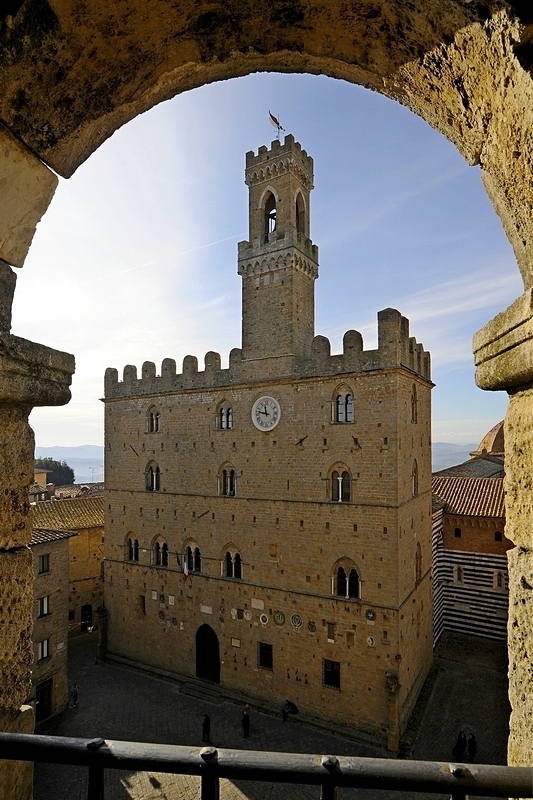 Volterra is a walled mountaintop town in Italy’s Tuscany region. It’s history dates back from the 7th. century BC and has many structures from the Etruscan, Roman, and medieval periods. It was one of the 12 cities of the Etruscan League and was a very important center in those days. After the Etruscan era the city became allied to ancient Rome then by the end of the 3rd. Century BC. In the 5th. Century it was a bishop’s residence the by the 12th. Century was conquered by Florence and fell under Florentine rule. When Florence fell in 1530 it ended up in the control of the Medici family then from there followed the history of the Grand Duchy of Tuscany. In pop culture it was an important part of the popular Twilight series written by Stephanie Meyer. In this series Volterra was home to the Volturi, a group of powerful ancient vampires who essentially ruled over all the vampires in the world. There are many interesting sites to in Volterra including the remains of a Roman Theater, Volterra Cathedral, the main piazza, museums which house works of Tuscan artists and ancient Etruscan funeral urns and other artifacts. And of course there are the city walls and some very well preserved gates. 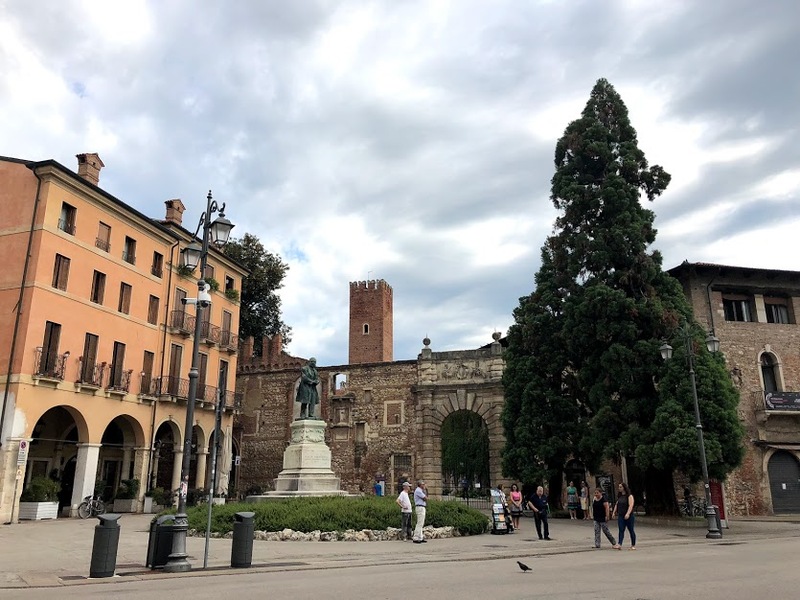 Volterra is definitely one of the must see Italian towns which is not on the regular tourist agenda, and that’s a good thing. Because it’s not on the regular tourist route it’s not at all crowded. 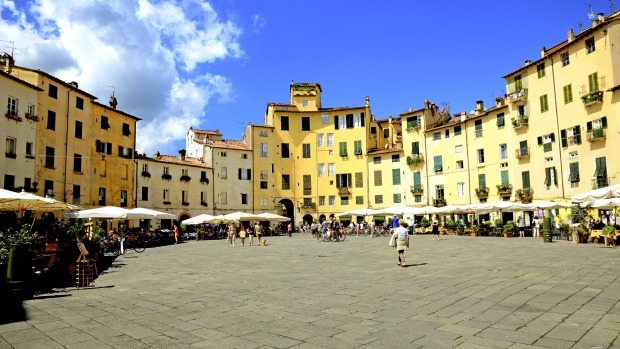 It’s a great town to visit to experience the authentic Tuscany. But it’s a bit hard to get to. The easiest way to get to Volterra is by car or if you don’t want to drive or hire a service by tour bus. If you want to get there via public transportation it’s doable, but not so easily done. Getting there by public transportation involves a couple of train or bus transfer. 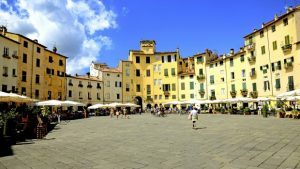 You can get there from any of the main Tuscan towns like Florence, Siena, Pisa, or Livorno. The closest train station to Volterra is Saline di Volterra which can be reached by only by the line running from the coastal town of Cecina. So from any Tuscan city take the train to Cecina where you can transfer to the coastal line, but be aware that train service is intermittent. So most folks take the train to Cecina then transfer to a bus to Volterra. So there you have it; 5 more must see Italian towns that are a bit off the beaten path. A day trip to any or all of these towns will give you a taste of the real Italy! Italy! It’s a country that’s on just about everyone’s “bucket list”. Sure you want to go to Italy to see the sights, visit museums, and of course eat, eat, eat! But is taking selfies in front of the Vatican or the Colosseum, or grabbing a slice of pizza and a cup of gelato on the run really your idea of an Italian vacation? If it is then go for it! But if you want to really experience Italy read on! Here are 5 unique activities to really experience Italy! 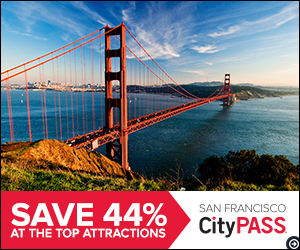 Some of these activities are seasonal, but hey, you haven’t booked yet right? 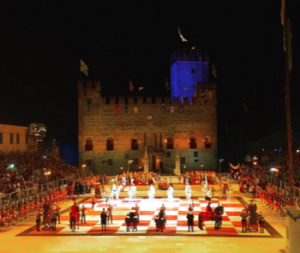 So plan your Italy vacation to be able to take part in at least one of these 5 Unique Activities to Really Experience Italy! Think Lucy and Ethel stomping grapes in one of the “I Love Lucy” shows and plan your Italian vacation between late August and very early October. That’s the Grape Harvest season or Vendemmia in most of Italy. 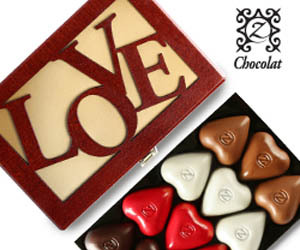 The exact dates vary from year to year and from place to place, depending on the weather. But it’s safe to say that by September the grape harvest is taking place in most of the countries vineyards. Many towns and vineyards throughout the country host grape harvest festivals. Vineyards open their gates and fields to the public for some fun, food, and of course drink. For the price of an admission ticket you can wander thru rows of grape vines, pick grapes, stomp them in huge wooden vats, then enjoy locally prepared food from antipasti to dolci, and of course taste the various wines the vineyard or winery offers. Several glasses of wine are usually included in the ticket price but you can buy bottles to take home or drink during the event at the vineyard. Trust me there will be more than enough wine to go around! 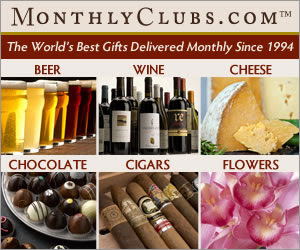 Click here to learn more about Grape Harvest in Italy! If you find yourself in Italy sometime between mid-October to early-December you can take part in the olive harvest. The craze may have been jump started by the popular book Under the Tuscan Sun, but there is something to be said about spending the day in the olive groves specially during harvest season. My husband and his relatives have many fond childhood memories of warm fall days spent picking olives in olive groves where they grew up. Of course picking olives is outdoor work that builds up an appetite so a hearty picnic lunch is definitely a must have. If you’re not the outdoorsy type then take a tour of the olive oil factory. It’s pretty interesting. You’ll learn how they take those olives and cold press them into incredible olive oil. Did you know that mills are communal mills called Frantoio where most of the local growers take their olives to be pressed? And did you know that olives are pressed only during the harvest season and the oil is stored to be bottled during the year? You’ll learn all about the pressing and bottling process if you take the short factory tour which of course ends with an olive oil tasting and some time to wander around the gift shop! Tour and tasting at the Bonamini Frantoio in Northern Italy. So you’ve been to a wine tasting and maybe even a pizza tasting, there are all sorts of tours around Italy that offer them. But have you been to a Pizza & Wine Pairing at the farm and vineyards that grow the food you’re tasting? Pizza & Wine Pairings in a beautiful hillside setting on a farm built on top of a 17th. century Benedictine convent is truly a memorable event! You can do this at the Fattoria dell’Eremo outside of Padua in northern Italy. The hosts are friendly and the food and wine are amazing! They will cater to your dietary needs just let them know your preferences. Yes there are pizza making classes and pasta making classes, they’re all great; but for a truly unique experience take an Italian cooking class at a local residence! 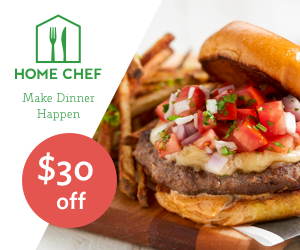 You’ll make everything from antipasti to dessert! Best of all you get to eat what you cooked! Email me for more information about this cooking class in Northern Italy. Every Italian town or city has at least one market day. For a truly unique local experience wander a local market or two. Markets are usually held at the town’s main square or in the larger cities like Rome the markets spring up along side streets around town. You’ll find everything from fruits and vegetables to household goods, and clothing and shoes at these outdoor markets. Some towns have specific days for specific vendors. Like in Vicenza food vendors are open in the main square and around town on Tuesdays; Thursdays are for clothing and household goods with a few food vendors around; and the last Sunday of the month is for the antique market. So find out what days are market days in the area you’ll be visiting. Markets are a great place to find an inexpensive lunch. You can grab a loaf of bread from the bakery stall then meat and cheese from the deli vendor. Top it all off with some fruit and a bottle of wine and you’ve go the makings of a picnic lunch! 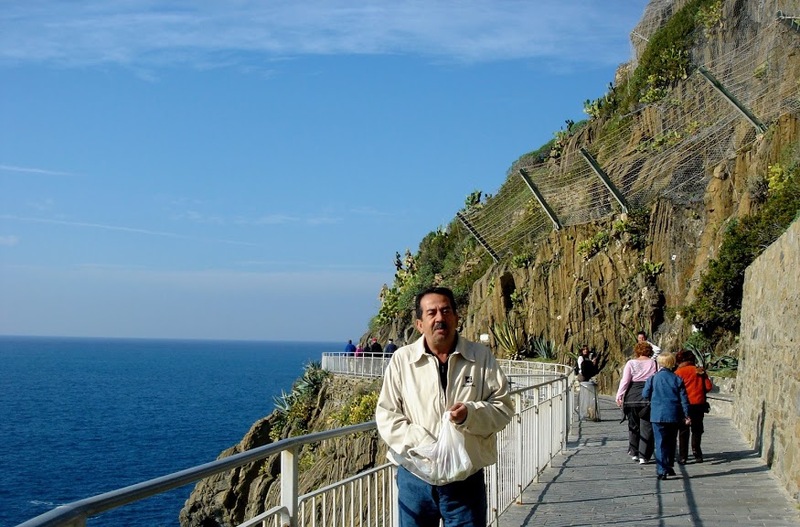 Let Savvy Nana Travel help you plan your Italy vacation! Padua, or Padova in Italian, is a quiet little city in the Veneto area of northern Italy. Unlike its illustrious neighbors Venice and Verona, Padua sees much less tourist traffic making it an ideal place to spend a few hours wandering its dense network of arcaded streets where you’ll find lazy piazzas, artwork by famous Renaissance artists including Donatello and Giotto, a university, bridges, and several churches including a Duomo and a Basilica. Padua is the setting for Shakespeare’s Taming of the Shrew. Although it’s not really certain whether the Bard actually spent time in the area it was clearly a region he liked. He set several plays in the Veneto including The Merchant of Venice, Two Gentlemen From Verona, and of course the tragic romance Romeo and Juliet which was set in Verona. 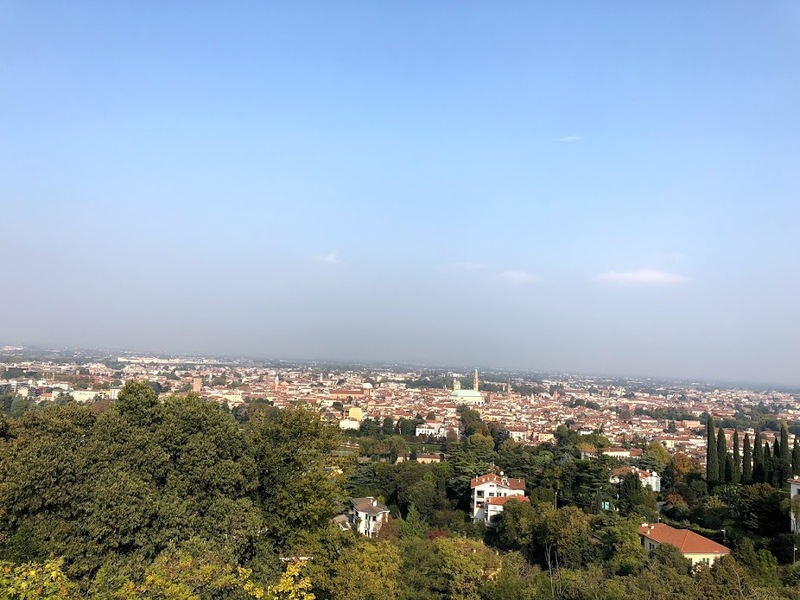 Padua is situated on the Bacchiglione River 25 miles west of Venice. 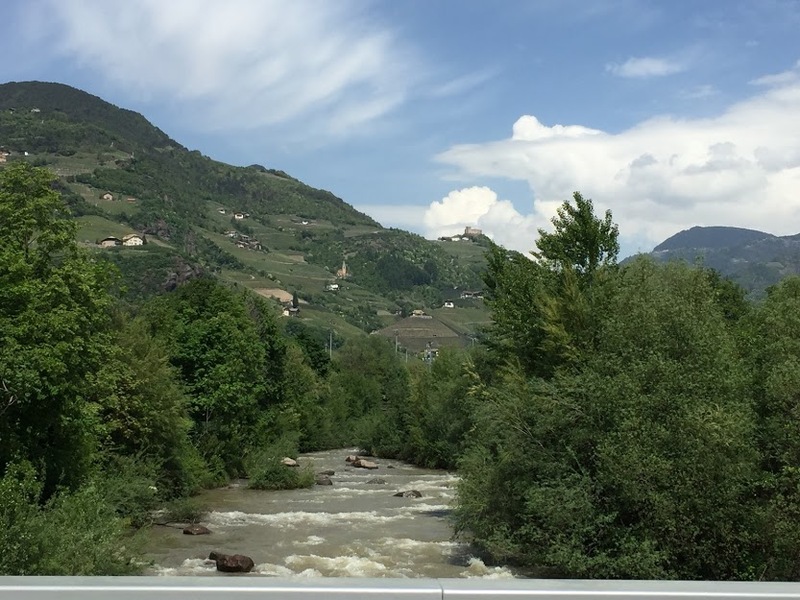 The Brenta River once ran thru the city and still touches its northern part. In fact the Brenta Riviera Cruise from Padua to Venice departs daily from the historic Burchiello’s Stairway at Portello the city’s ancient river port. This slow boat takes tourists down the Brenta River, thru its canals, and stops at historic villas once home to the Venetian elite. That’s a day long excursion from Padua and ends in Venice in the late afternoon. Other than the river the city is home to the University of Padua one of Europe’s oldest universities founded in 1222. Galileo Galilei lectured at this same university between 1592 and 1610. It is still a bustling university today! 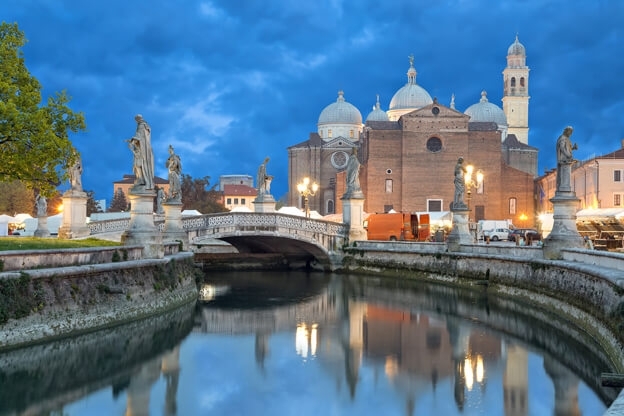 In Padua one can visit “Il Santo” as the locals call the Basilica di Sant’ Antonio da Padova the most celebrated Paduan church. 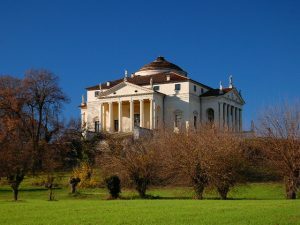 It houses the bones of the saint in the chapel richly decorated with carved marble and the works of great artists including Sansovino and Falconetto. The church is dedicated to St. Antonio of Padua aka St. Antonio of Libon, the Portuguese Franciscan who spent part of his life and died in the city. 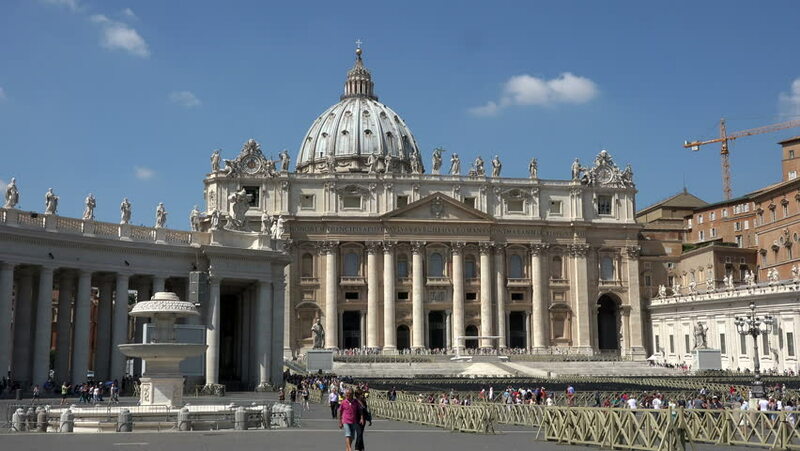 This Basilica is one of the eight international shrines recognized by the Holy See in Rome. Although Il Santo is the city’s beloved church it is not the titular cathedral of the city. That honor belongs to the Basilica Cattedrale di Santa Maria Assunta a church dedicated to the Assumption of the Virgin Mary. It is the seat of Padua’s Bishop. The current structure dates from the 16th. century and its construction involved Michelangelo. A must see for art lovers is the Cappella degli Scrovegni. 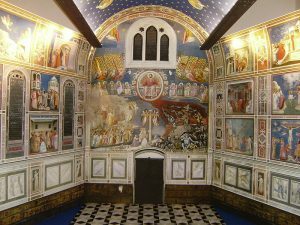 The chapel situated in a small church next to the Augustinian monastery contains a fresco by Giotto that is considered to be a masterpiece of western art. Another Basilica with beautiful chapels and artwork is the one adjoining the Benedictine Abbey of Santa Giustina. The abbey and its adjoining Basilica faces the Prato della Valle. The church was built in the 520s to house the remains of St. Justina of Padua and other Christian martyrs of the city. The interior is home to chapels dedicated to various saints and is decorated with ornate multi colored marble from quarries in France, Genoa, Padua, and Carrara. Statues and paintings throughout the church were done by various artists. My favorite place in the city is the Prato della Valle. It’s 90,000 sq. meter elliptical “square” in the city. It’s border is defined by a moat that is ringed by 2 rows of statues depicting Padua’s elite citizens of old. There are 4 bridges that span the moat and allows you to enter the huge green space where you’ll find the fountain in the center. 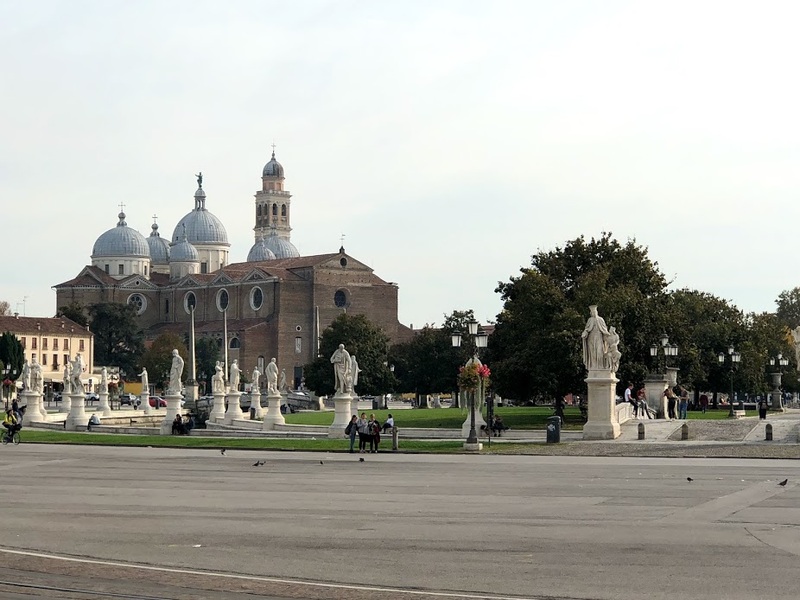 The Prato della Valle is a great place to let the kiddies burn off all that pent up energy while the adults relax on one of the low walls or on the grass. At certain times of the year the square hosts concerts, markets, fairs, and other events. The square is surrounded by shops, restaurants, and cafes. It really is a great space to relax after wandering this charming city! Ready for your Italian getaway? 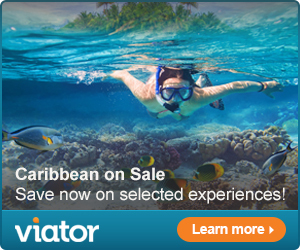 Let Savvy Nana Travel help you plan!